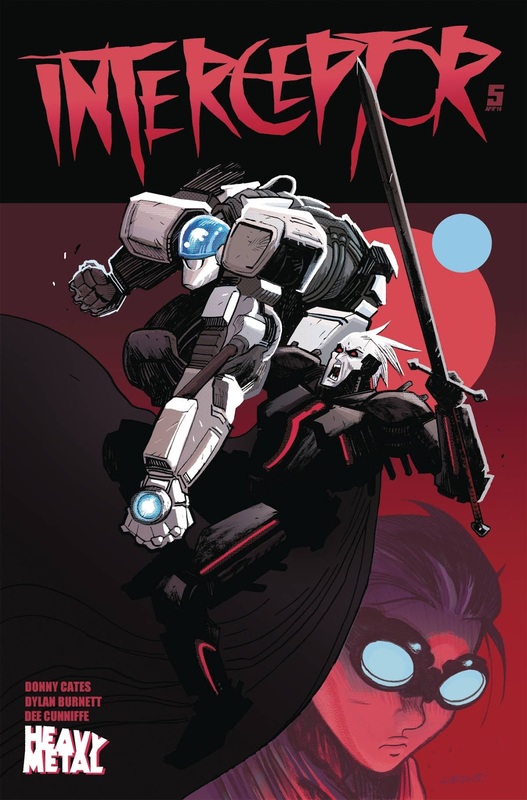 It's a shame that Heavy Metal's 'Interceptor' ends with issue five. Well, it doesn't have to end as it could be picked up for an ongoing, that would be the smart play. There's a bunch of mixed feelings about it wrapping up the first arc in a satisfying way while leaving the door open for more crazy sci-fi vampire adventure. Without spoiling anything, let me just say Donny Cates and Dylan Burnett bring it all to a close that doesn't cheat the reader and puts a bloody bow on the Vampire King storyline. Poli and Weep are allowed to shine with huge exciting set pieces that are crowd-pleasers. The conclusion even expands on Poli's background revealing some surprising details. Burnett's ease with action is effortless as the layouts allow for kinetic movement from one punch or kick to the next. The sequences are almost like a storyboard for an anime film, larger-than-life and compelling. Dee Cunniffe does a great job of drenching the panels in specific color schemes that add depth and keeps the focus on the combatants. 'Interceptor' deserves to go on because Cates provides big fun spectacle with strong multi-dimensional characters. Who else could make vampires fresh again in this day and age? Support 'Interceptor,' pick up back issues, buy the trade in droves and share them with friends and family. If you've been reading 'Interceptor' from the beginning you'll be rewarded with an epic ending that feels conclusive but allows for the story to continue should it get picked up. I hope it does as Cates and Burnett make a great team with a vivid imagination giving Heavy Metal an established winner every month.